Nicola Sturgeon has said it is "time to compromise" to find a "common sense" solution to Brexit, as she sets out her alternative plans in a new paper. Scotland's first minister reiterated her backing for UK membership of the single market and customs union. She said MPs should not be "railroaded" into accepting a bad deal by fears that no deal would be "a catastrophe". The UK government said it had put forward "a precise and credible plan" for a future relationship with the EU. Later, the first minister met Prime Minister Theresa May for a briefing on the current state of the Brexit negotiations. The so-called Chequers plan involves the UK and EU sharing a "common rulebook" for goods, but not services, so a hard border between Northern Ireland and the Republic of Ireland can be avoided. Ms Sturgeon said this plan had been rejected by European leaders and could not command the support of MPs in any case, saying that "a head in the sand approach will not make the Chequers ostrich fly". And she said it was "time for individual MPs to consider what compromises they think are justified" to reach a "common sense" outcome. On Sunday, the BBC learned that Scottish Tory leader Ruth Davidson and Scottish Secretary David Mundell could resign from their roles over a possible Brexit compromise. In a letter to the prime minister they said they would not support any deal that introduces different arrangements for Northern Ireland. UK government sources have warned that Brexit negotiations have hit a "real problem" over the issue of the Irish border. The EU is believed to be seeking further reassurances to prevent the return of a so-called hard border involving physical checks. 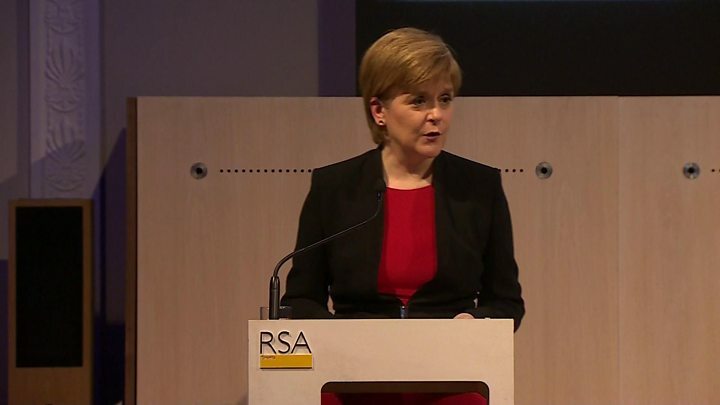 Speaking at the Royal Society of Arts in London, Ms Sturgeon said: "The UK is scheduled to leave the European Union less than six months from now - but both a withdrawal agreement and a clear, detailed statement on the future relationship must be concluded much sooner. "As things stand, we still have no guarantee of a transition agreement or a detailed proposition setting out the future trading relationship between the UK and EU. "The UK government seems intent on presenting a false choice between whatever bad, possibly blindfold, deal they manage to conclude and a no-deal scenario. "For MPs to support a bad or a blindfold Brexit, a cobbled-together withdrawal agreement and a vague statement about our future relationship, would in my view be a real dereliction of duty." At the beginning of the summer the government's senior ministers held a day-long meeting about Brexit at Chequers, the prime minister's official country home in Buckinghamshire. The aim was to agree what the government wanted from negotiations with the EU about the future relationship between the UK and the EU over Brexit. The plan that emerged from the meeting has become known as the Chequers plan, or sometimes simply Chequers. The key aim of the plan is to create a free-trade area for goods moving between the EU and the UK while stopping freedom of movement for people between them. To do this, the UK would commit to collecting import taxes, known as tariffs, on behalf of the EU for goods that arrive in the UK on their way to the EU. Meanwhile, goods that were staying in the UK could be charged at a different rate, depending on any future trade deals the UK agrees with other countries. The UK would also agree to a "common rulebook" with the EU for manufactured goods and food, which would mean following EU rules and standards. In the future, if the EU changed any of its standards, the UK could decide not to follow those changes but at the risk of losing the free trade agreement for those goods. The government believes the combination of the common rulebook and collecting tariffs for the EU would avoid the need for checks on goods passing between the UK and the EU, including over the Irish border. However, the EU doesn't accept all proposals in the Chequers plan. It thinks the proposals amount to "cherry-picking" parts of EU membership - in other words, keeping the bits the UK wants to stay attached to, while rejecting other rules. The EU is also unconvinced the UK would be able to accurately track all the goods moving through it. Ms Sturgeon was in London launching her government's latest paper of Brexit proposals, which "reiterates" her longstanding argument about staying in the single market and customs union. The first minister said that if MPs vote down the deal Mrs May brings back from Brussels, then single market membership would be the best option. She said: "It is probably the case that the only option with any chance of commanding a parliamentary majority is single market and customs union membership. "I'm not saying at all that the way to such a solution would be easy, but it might well be the only solution which is not completely impossible at this stage. "It should be acceptable to the EU, it avoids the worst economic damage that Brexit will do, it resolves the Irish border issue, and it does come close to reconciling the different views of Leavers and Remainers." Ms Sturgeon called for "a genuine attempt to find some common ground across what is currently a divided parliament and a divided UK". She said: "We have long demonstrated our willingness to compromise, and I think it is time the UK government did likewise. "And as the crucial vote looms closer, it is also time for individual MPs to consider what compromises they see as justified and which are not, if they are to serve their constituents and the wider public interest. "If they do that, I do believe that a common sense outcome could yet be found." Last month, Ms Sturgeon called for Brexit to be delayed beyond next March if the UK had not secured a detailed agreement with the EU by then. She told the BBC it would be "absolutely reckless" to leave without knowing what would replace the country's existing relationship. Mrs May has said delay is "not an option". A spokesman for the UK government's Department for Exiting the European Union (DExEU) said: "We will have an ambitious course outside of the EU that enhances our prosperity and security and that genuinely works for everyone across the UK. The Scottish Conservatives meanwhile said Ms Sturgeon's speech contained "absolutely nothing new" and was made "in the hope of drumming up the prospects for Scottish independence". Labour MP Ian Murray warned the SNP "not to use the Brexit chaos to pursue its dream of breaking up Britain", while Lib Dem MSP Alex Cole-Hamilton said Ms Sturgeon's comments were "not helpful in the slightest".